If you ever looked for food games for Android and haven’t found any interesting one, then you must try this popular game entitled Food Street APK 0.16.3. You may build your own restaurant of your dream. Furthermore, this game lets you manage your very own business just like the real one. The good part is that this app is free to download. However, the thing is, when you want to get the special items, this app lets you buy with your only permission. Besides, this game is designed in great 3D graphic which comforts your eyes. Not to mention, you will see that there are a lot of ingredients you want to try once you get the application. It is so cool to combine and create your custom menu. This game is also available in several cool features which let you trade your own ingredients and dishes with other players. Another nice part from this game is the collection of the ingredients and dishes from all over the world. With the almost 5/5 rating, this game is totally addictive and fun. It can be said that this can really help you from your stuck boring moment. The limitation of the age is starting from the age of 3. Therefore, this game is safe for those who are above 3. With the seasonal events on any special occasions, this game also provides new dishes and new themes for the decorations. You can custom the decorations to attract the customers to visit your own restaurant. You can also customize your own staff to make the customers happy because this game also has the feature of competition which will ask you for joining the competition. At first, you need to join any Food Clubs and then you will have a chance to compete in friendly competition. So, to say at least, it is so entertaining to play Food Street for Android. 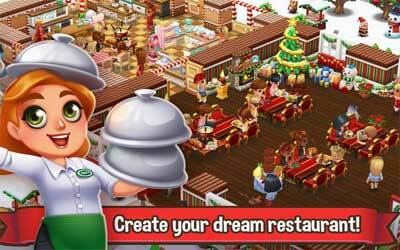 Free to download – a fun restaurant game with stunning 3D graphics! Build, decorate and manage your very own restaurant! Collect ingredients and cook delicious dishes from all around the world! Customize your staff and serve happy customers! Trade ingredients and dishes with friends and other players! Collaborate in Food Clubs and compete in friendly competitions! Have fun in seasonal events with new dishes and new themed decorations! FOOD CLUB GIFTING (lvl 18+): Send requests to Food Club friends for help with any ingredient or dish! “Ready Set Cook!” Community Event runs July 28 – Aug 1st! Special prizes include FREE exclusive Rio Parrot and RIO Sculpture!! Limited items from July 27. Look out for cuddly Baby Jaguar Pets! Recipes with lobster/prawns now require only 1 of each rather than 2!